This is a bonus book in my collection of 32 cooking books that you can check out on the link below. In the images above you can see what is in this book. Just click on each image to enlarge it. 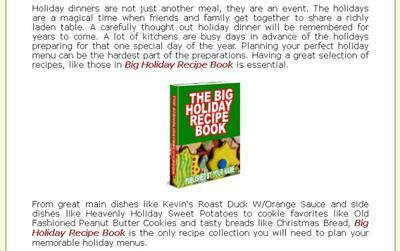 You will be absolutely delighted with the massive range of Holiday recipes to select from - even instructions for how to cook your Thanksgiving Turkey has pages and pages of detailed instructions for you to make sure it's a winning meal this year! Your kids will also be able to help out by making their own snacks and sweet treats! 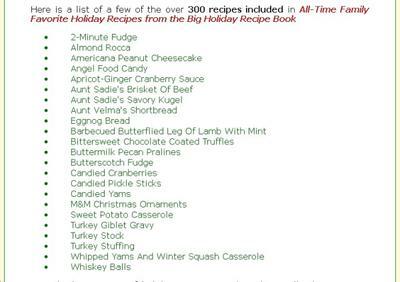 The whole family can get involved making delicious Holiday Gifts from the recipes in the book, including decorations as well as foods! You will have all the tips and tools on hand to help you manage stress and stay in control this Holidays! This chance is just too good to let pass - so click the link above and grab your copy of this great Holiday collection. Your get immediate 24/7 download, no waiting, no delays! Preheat oven to 350 degrees. Combine flour, oats, baking soda,cinnamon and salt; set aside. Cream butter; gradually add sugars,beating until light and fluffy. Add egg and vanilla; mix. Alternate additions of dry ingredients and pumpkin, mixing well after each addition. Stir in morsels. For each cookie, drop 1/4 cup dough onto lightly greased cookie sheet; spread dough into a ghost shape using a thin metal spatula. Or make a quick ghost pattern of heavy paper. Make 2 or three poses for realism. Bake 20-25 minutes, til cookies are firm and lightlybrowned. Remove from cookie sheets; cool on racks. Spread with whiteroyal icing. Trim brown face features with tube-icing.